The recent mountain of allegations of sexual harassment and assault levied against Harvey Weinstein appear to be having a knock-on effect in Hollywood, encouraging women throughout the industry to come forward with stories of powerful men behaving in inappropriate, creepy, and criminal ways. Today, The Hollywood Reporter has a conversation with actress, broadcaster, and Inside Edition correspondent Lisa Guerrero, who opened up earlier this week about the bizarre audition process she underwent for Steven Seagal’s 1997 EPA thriller Fire Down Below. 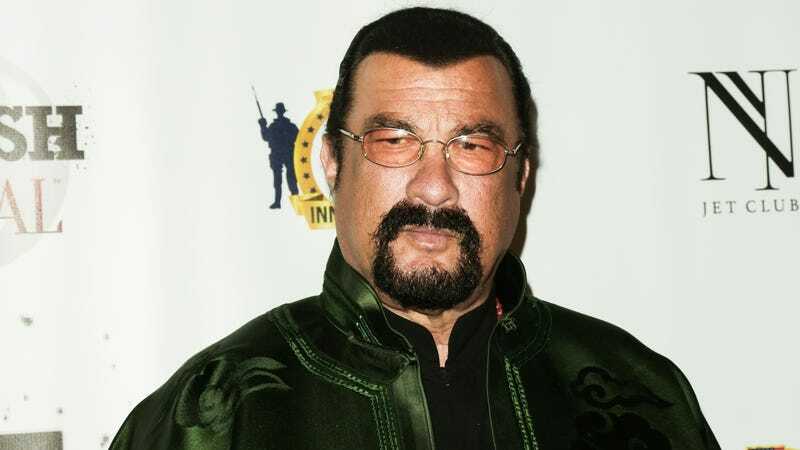 Guerrero says she was invited to Seagal’s Beverly Hills mansion for the audition; sensing something weird, she insisted that the film’s casting director, the late Shari Rhodes, accompany her. When the two arrived, they were greeted at the door by Seagal himself, clad in a silk robe, and apparently “surprised” to see Rhodes there. He looked surprised that she was with me. Then he let us into the foyer of his house which was decorated in an Asian style. The outside was a big Beverly Hills mansion, but when you go inside the house it looked very Asian inspired. He waved me into another room. That room was also Asian. There was a big chair on a platform. Again, it looked like a big Asian throne. He sat on the chair in the silk robe and asked me to perform the scenes I had prepared. I had worked on those scenes for days. I performed them for him while he sat on this throne. It was so strange. Guerrero gave her audition and then escaped back to her car—only to be summoned back to the mansion later that day for a “private rehearsal” with Seagal. When she understandably refused, she was told she wouldn’t be getting the part as the film’s female lead; instead, she was offered a smaller role. But when she arrived on set, Guerrero found that she was the only woman present among a crowd of leering men, and was forced to fend off Seagal’s offers to meet with him in his dressing room. Her part was later cut from the film.